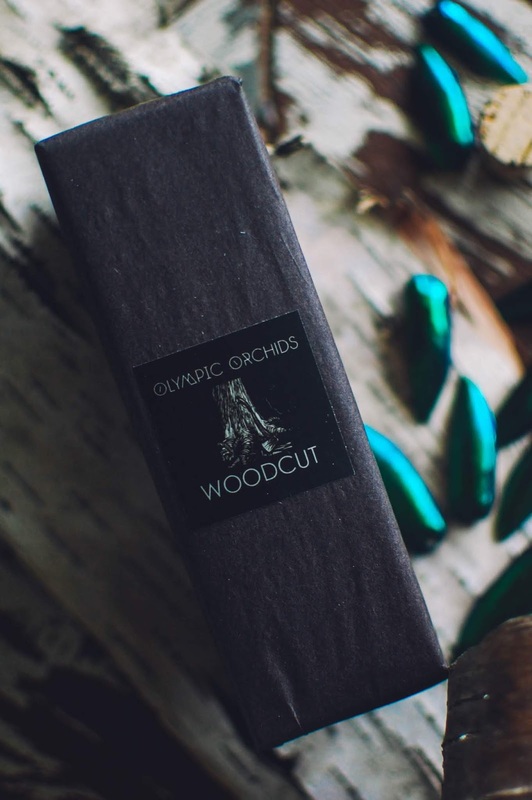 Woodcut from Olympic Orchids is a scent that I sampled three years ago and loved but then it slipped away like a silvery minnow between the synapses of my brain. Coming back to it all this time later, it still is a beautifully unique fragrance that captures my heart. 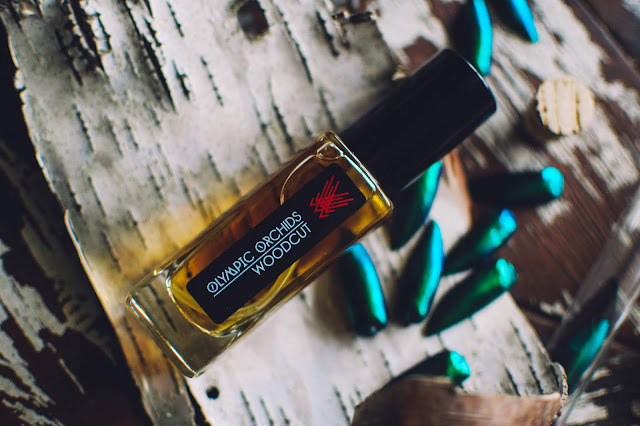 It won the 2015 Art and Olfaction Award in the artisan category so I know I am not the only one who appreciates this wood filled beauty. 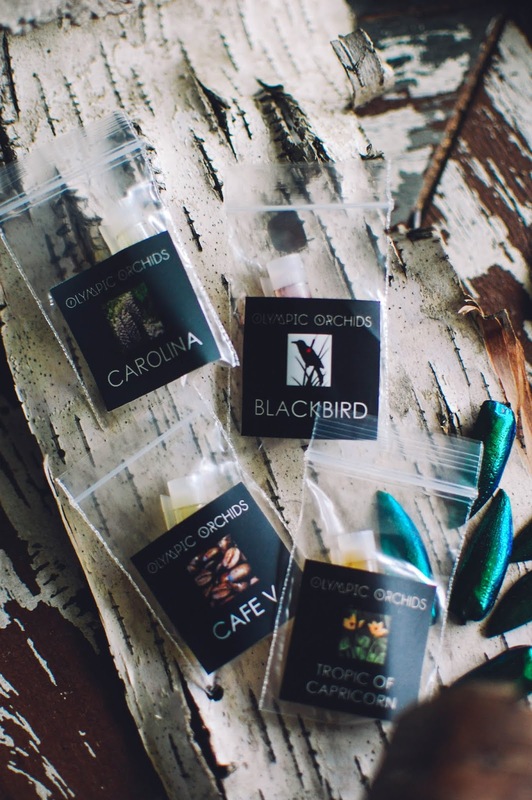 Dr. Ellen Covey opened up an orchid nursery in 2006 that bloomed into a perfume house in 2010, where all fragrances are designed, created and bottled by hand using fine ingredients. The fragrances are parfum (extrait) concentrate at 20-30% fragrance concentrate. Green needles, sticky sap, dry heartwood, then smoke. Before the fire burns acrid it turns sweet with always the heartwood present. It reminds me of countless years of my childhood picking out the perfect Christmas tree, then the ritual of sawing off the bottom part to make sure it is perfectly level and the lower branches are trimmed. Candy dangling from my lips from a holiday bowl, minute wood shavings swirling like snowflakes in the night sky, illuminated by strands of bare bulbs, and always the fragrance of the prefect Christmas tree. Even though initially it reminded me of a wonderful childhood memory, it was created as an outpouring of anguish for the razing of the earth that so frequently happens in the name of progress. The cutting and slashing and burning of ancient spirits and primitive life to make space for the K-Mart that will then go bankrupt. Bright, fizzing bursts of turpentine ignite the tinder softwood pine kindling. Evergreen boughs and green bendy needles sizzle and pop amid sweet smoke and tongues of flame. Burnt caramel oozes like amber sap, sticky tear drops flowing through the heart of the perfume. As it dries down the sweetness abates and the burning embers of charred cedar warm the skin. It still makes my heart sing. I picked up four samples when I was shopping. I mostly randomly peeped at scents whose name caught my eye then checked out the notes and went from there. Most samples are $3 but the all-natural ones are about double. Cream, heavy whipping cream that coats the tongue, spills onto the skin. Finely grated cardamom peppers the dripping cream. Fairly quickly smoky leather with tarry orris and creosote aridness emerges from the cream and cardamom, a subtle morphing until it is transformed from creamy white to inky black. Piquant chai spices underscore the leather while the swirl of heavy cream lingers. Eventually it softens into a blissful vanilla woods with that last lingering thread of smoke. Boozy, heady and smelling of nicotine. That warm sharpness of raw nicotine. Then the coolness of herbal wintergreen. Underneath all, that earthy animal tang. This must be the African stone (fossilized urine from a hyrax) and wild tuberose mingling. This is a heady, musky opus that will thrill the olfactive adventurous. Wild green vines that grow with an insatiable appetite to cover all and climb as close to the sun as possible tumble on the skin with the first inhale. Sweet tea. Sweet tea is there too. With a slice of lemon that twists into lemony bright honeysuckle. The honeysuckle drips with indolic honey. Lemony honey drips down, down, and onto the swell of large buttery petals, magnolia petals made of ivory velvet. The heart of the perfume rubs soft between the fingers and tastes vibrant and sticky on the lips. Blonde tobacco, newly cured, blends with golden hay and lends a pleasant mustiness to the bed of white southern petals. Further into the scent, smooth vanilla and dusky tonka round out the florals and bid them farewell. The far drydown becomes earthy with sweetgrass vetiver. Carolina reminds me of sourwood honey and heavy sun-drenched lemons for most of the scent. Beautiful, beautiful perfume. Summer brambles arch and loop their thorny wire on the fringes of an evergreen forest. Between the spikes swell shining onyx berries, the plant both tempting one closer with its juicy lures yet also drawing sharp weapons against thievery. Sable amber and burnished elemi, which emits traces of frankincense, pull through the balsam trees and blackberry bushes. Cedar and resins and musk flow freely through these openings and swell on the skin. Mardi Gras- Notes: Orange blossom, neroli, cistus, benzoin, vanilla, civet and a special musk blend. Bitter green oranges suddenly swell from orange blossoms and spill on the ground then rot into the soil instantaneously. In an eye blink, decay. It smells spooky. Then the eerie whiff of primal fur. Is that a wolf lurking in the shadows? Smelling of sebaceous pelt and sepia musk? Wow. This one is intense. Between the cistus, civet and musks, my mind is blown. I forgot how evocative artisan fragrance can be, how artful at imparting a mood. I can see the close bodied, sweat filled and hormone fueled nights of Mardi Gras would inspire a scent like this. I have not smelled a good skank in ages. This was great. Thank you Ellen! 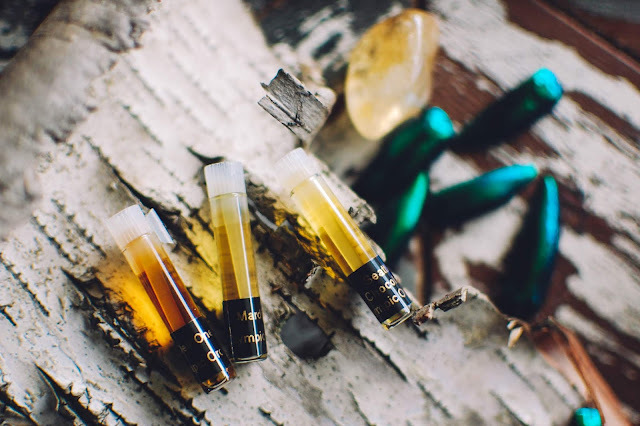 Seattle Chocolate- Notes: Dark cacao, black Bourbon vanilla, sweet poplar bud, evergreen wood, oakmoss, gourmand musk, silver fir and fir balsam absolute. A bubbly chypre immediately turns into a boozy chocolate liqueur infused with evergreen needles. Sparkling and crystalline. Golden bronze oakmoss shifts the scent from gourmand chocolate back into vintage territory with its haunting peachy greenness. It nuzzles down into a sweet wooden vanilla. This is a chocolate I want to slather all over. Chocolate is a hard sell for me, but this one and Solstice Scents' Pinyon Truffle are my two favorites so far. Dev One: Foreplay- Notes: Three kinds of synthetic oud, woody accord, black vanilla, tolu balsam, clear labdanum absolute, synthetic musk deer accord, Africa stone tincture, ambergris tincture, synthetic tincture, beeswax absolute, frankincense, African bluegrass, giant arborvitae wood from the Pacific Northwest and cinnamon leaf. Forbidden hard candies tucked inside the belly of a cedarwood box. Sweet and furtive like kisses stolen under the shroud of woods. Surreptitious kisses build and pulse with passion and animalic skin musk curls like steam about the joined slivers of flesh, hands, arms, necks. What was once a tender shadow of musk becomes darker and more viscous. Smoky tar and labdanum. Slipping into the black labyrinth of intimacy. The base of the aroma comes full circle and it ends with resinous cedarwood, trailing the last dregs of sated smoke. This one is deep and lovely. Intense and long lasting. I thoroughly enjoyed sampling so many fabulous scents. The surprise hit for me was Seattle Chocolate. I will be scooping up more of that one. This time I will not forget. 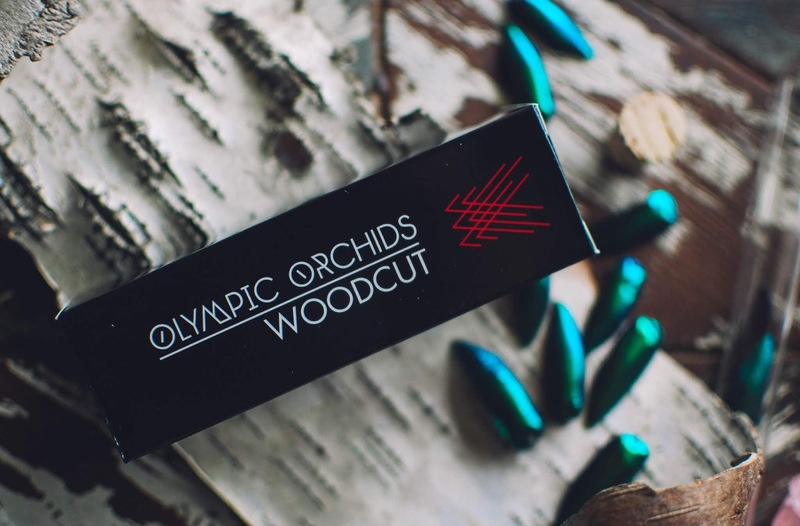 Have you tried Olympic Orchids? Which one of these would you sample? 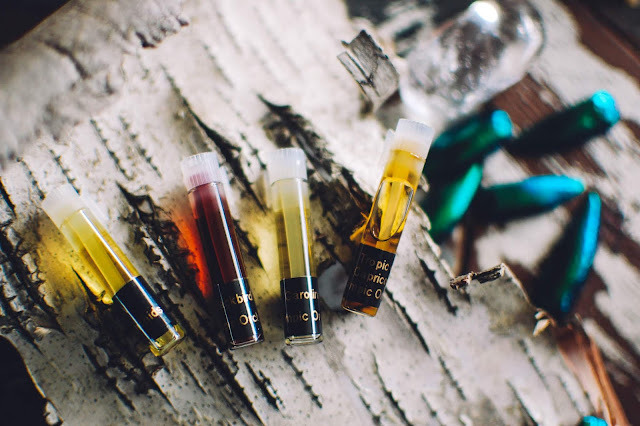 I never heard of this vendor and wow do these blends sound so very unique and different! Cafe V and Dev One Foreplay sound like something I'd try out. They are really moving scents. Vivid and plush. I would definitely follow them on Facebook. Not sure about IG but they have a profile. I tend to see sales and such on FB. I think Seattle Chocolate and Pinyon Truffle are different enough to warrant owning both. PT has more of a velvety sweetness to it while Seattle Chocolate is more arid and resinous. But both are simply gorgeous! Do you like Pinyon Truffle? I like Pinyon Truffle, but I typically need to be in the mood for chocolate/ cocoa scents. Same. I rarely like them. These are the only two I enjoy, truly enjoy. Every single one of these scents sounds amazing to me! You are such a gifted writer Julie! You take me on a journey through each scent, note by note until I swear I can actually smell it! I will definitely be ordering from this company soon! They really are works of art. Thank you for your kind words. You won't regret giving Olympic Orchids a sample. <3 If you end up trying some out, let me know! Oh!!! Hey Margaret!!!! Now I am really excited to hear what you think! You have great taste. You know that box of blue sugar wax goodies you sent me a while back? It started me up on a Blue Sugar revolution. I want to mix it with everything now. LOL!